As our community partners and volunteers focus on the well being of others, there is a continued need to focus on individual health. 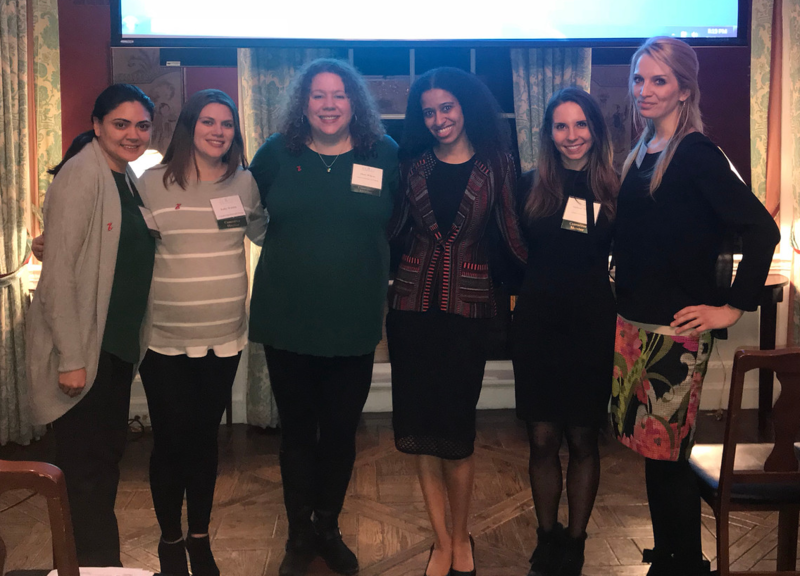 Recently, the NYJL’s Volunteer Education & Training (VET) committee featured an evening with Dr. Rachel Marie Bond, to make sure that NYJL volunteers are educated about making smart heart health decisions in their daily lives. VET strives to highlight topics that can impact the volunteer experience, and our health impacts everything we do. Heart disease is the leading cause of death for women, and we make a point to educate NYJL volunteers about different aspects of heart health every year during American Heart Month. As volunteers, we see the value in being a healthy, active resource in the community and the need to put ourselves first in order to help others. Dr. Bond is currently Associate Director of the Women’s Heart Health Program at Northwell Health Lenox Hill Hospital and Assistant Professor of Cardiology at Hofstra Northwell School of Medicine. She has a vested interest in the community and making sure women are mindful of their health and wellbeing. During the training session, she covered the differences between heart health in men and women, risk factors for cardiovascular disease (CVD), and how to prevent CVD. Volunteers learned that more women die of heart disease than all forms of cancer. According to Dr. Bond and the American Heart Association, a woman dies of heart disease every 80 seconds and 90% of women have at least one risk factor. According to Dr. Bond, heart disease can present differently in women — symptoms can occur without showing evidence of a blocked artery, since the disease tends to diffuse to smaller blood vessels. In addition, a third of women have atypical symptoms. Looking for ways to lower your risk for heart disease? The American Heart Association has identified seven lifestyle recommendations in order to prevent heart disease. They include stop smoking (it’s never too late for your body to start repairing! ), be physically active (150 minutes of moderate activity a week or 75 minutes vigorous activity and strength training twice a week), eat a heart healthy diet, maintain a healthy weight and keep your BMI under 25, keep a healthy blood sugar level, keep cholesterol levels under control, and maintain a healthy blood pressure. Looking for an opportunity to be both physically active and active in the community? Be sure to sign up for one of the upcoming PIP Park Days. Join fellow volunteers at Corlears Hook Park on the Lower East Side, where you can help paint, plant and spruce up the park.